I got the semi-hollow TC body. It was amazing! It was surprisingly easy to prep for painting as it shipped pretty well finished. Once sanded, the paint went on nice and easy. The matte finish I put on it looks awesome!!! This was the first DIY guitar that I have done, but definitely not the last! I would definitely recommend Solo Music Gear DIY guitars to anyone that wants to build a good quality guitar that sounds great! I never owned a Telecaster before, so I thought I would build one. I did plenty of research and Solo is by far the best guitar kit company in the world. 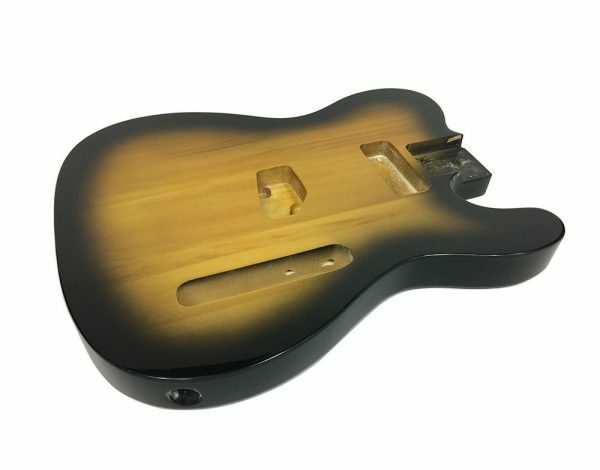 I started with a pre-finished black Telecaster so I could focus on learning wiring. I did a little finishing work on the neck, but did not add much to the existing wood. Just a few coats of stain to protect it. Matt was an amazing help. In only a few hours after I did the finishing work on the neck, I had my Telecaster assembled and it was gorgeous! Worked like a charm! I am not addicted to Solo guitar building kits. Working on a Les Paul right now and Solo just happens to have kits for every type of guitar I have ever wanted! I like that I can now change out the pickups if I want because I learned how to install pickups while doing the Telecaster project! Great product! Cannot wait for my next guitar project!